We would like to thank our partner stables and trainers for the great working relationship we have with them. All statements are translated from the German original. German Horse Center is an excellent place for finding high-quality horses for sale accompanied by a professional all-round service for clients from around the world. 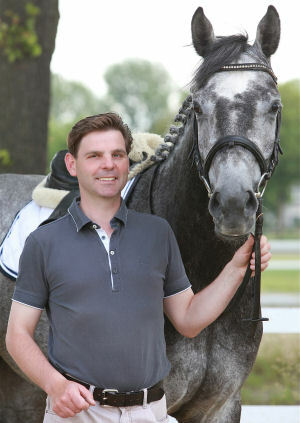 I have already sold a number of dressage and eventing horses to international clients via German Horse Center. For us, the process of selling horses involves trust, integrity and professionalism, with customer satisfaction being a top priority. Thanks to the well thought-out GHC concept, our philosophy is a perfect match with the core competences of GHC; this has already made it possible to find and form successful horse and rider combinations many times. GHC is a competent partner for us and enables straightforward cooperation combined with professional marketing at global level. Our competition and training yard has been a proud partner of the German Horse Center since early 2015. We always work in accordance with our corporate philosophy "A good and conscientious training of horse and rider is the key to success". Every horse and every rider is individual in terms of their way of being and their sporting talents. We successfully train all manner of horses in our competition and training yard, ranging from talented young newcomers to junior and amateur horses as well as elite horse for the top levels of equestrian sport. With the extensive portfolio and professional presentation on its website, German Horse Center provides customers with the opportunity to make a detailed preliminary selection that suits their individual criteria and needs. The customer thus has a firm idea of what he/she is looking for, and we are in a position to create a nice framework within which to present our sport horses. The Personal Guide Service that can be booked via GHC also allows a very professional organization of the entire process. The optimal assistance provided to customers means that they can concentrate fully on trying out the horses. The contact with the customers via GHC creates a very open, transparent and confidential basis for future cooperation, which has the mutual goal of achieving the best possible success for horse and rider. Due to the excellent cooperation, we have already been able to successfully link up horse and rider a number of times and enjoy following the results of our horses, both abroad and of course in Germany, each week. We would like to thank GHC and we look forward to continuing our excellent partnership. I really appreciate the open, honest and good communication at German Horse Center. The scheduled activities are always well-organised and thoroughly prepared. I look forward to continuing our excellent cooperation. Our dressage and training horse stables has been a German Horse Center partner since 2013. At our family dressage stables in Nottuln, Germany, we breed dressage horses, train them in line with their age and then offer them for sale. The horses are in our hands from birth. We can therefore inform prospective customers about the entire history of each horse and thus create the necessary basis for trust when it comes to identifying an optimal combination of horse and rider. German Horse Center is the perfect extension of our philosophy. By presenting the horses using a combination of pictures and videos on the internet it is possible to convey a good first impression of them. The detailed and target group-oriented descriptions of the horses help attract the right prospective customers for our horses. The committed, serious and transparent customer service provided by German Horse Center enables potential buyers and vendors to create a shortlist at an early stage. Even in our first year as a GHC partner, we were able to sell our sport horses to some very nice customers from countries such as Switzerland, Italy, Australia and the USA. We would therefore like to thank German Horse Center and look forward to a continued fruitful partnership. German Horse Center is an ideal partner for us and is the perfect forum for presenting our stable’s philosophy, as there is a real focus on values such as quality, transparency, integrity and trust. The professional organization of the customer services and the personal tour guides allows us to concentrate on our core tasks – training our horses and pupils. We very much appreciate the high quality cooperation! In our training stables, we always have a wide selection of horses available for sale, ranging from youngsters to top, advanced class show jumpers. 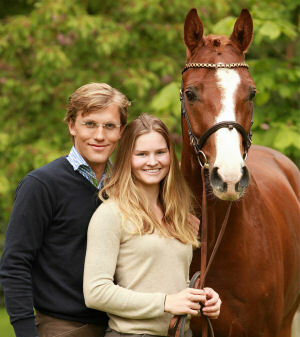 Contacts established via GHC primarily involve customers looking for high quality horses for sale. And some of these customers have already contacted us again to buy further horses. GHC customers are discerning, knowledgeable and pleasant to deal with. The collaboration with GHC is very reliable and professional. We do not generally display our horses for sale on the Internet, but the GHC website provides a platform that presents the horses online to an international audience in a very professional manner. This relieves of a great deal of our marketing work and gives us access to an entirely new customer base. We fully recommend GHC. 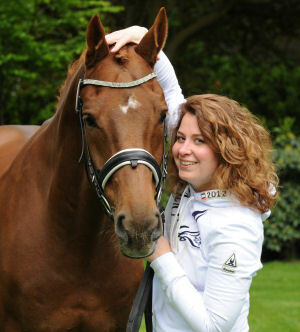 Julia Wentscher with her horse Alexsandro, by Samba Hit, born in 2005. Our partnership with German Horse Center had only just started when we sold the first horse, a beautiful chestnut mare, which went to Poland. Since then the partnership has gone from strength to strength, with both parties knowing they can rely on the other. We know that GHC sends us serious potential clients who are looking for the ideal horse and who have a real intention to purchase. And GHC knows that the potential clients will be served in a friendly, serious and professional manner and that our primary aim is to find just the right horse for the purchaser. Via GHC we have sold horses to customers in, among other countries, England, Germany, Switzerland and Poland. The briefing we receive is excellent, as this lets us know exactly what the client is looking for so that we can present ideal candidates. The transparently structured system of commission payments is also good, and differentiates GHC from other, sometimes quite unprofessional intermediaries. The fact that GHC also offers to take care of the photography and video recordings is also excellent. As I myself am a horse photographer, we don’t usually need this particular service, but it could be of great benefit to other stables and makes the use of the professional marketing services offered via an internationally reputable platform even more attractive. Thanks to our partnership with GHC, we have been able to expand our customer base significantly. In particular over the last few months we have also got the impression that the list of GHC clients is growing steadily and have noticed that we are acquiring increasing numbers of clients from outside Germany. It’s great to know that GHC continually seizes all possible marketing opportunities and is always refining its approach, thereby raising its profile. We look forward to the future! 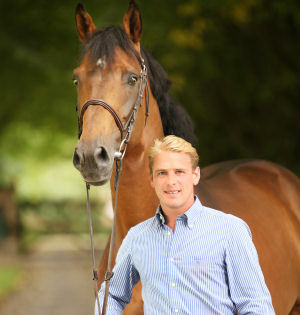 Kai Ligges with his successful and approved stallion Cayetano L.
Initially, we were debating for a long time whether co-operating with German Horse Center would make sense for us. Having spoken to acquaintances and friends, we have finally decided to go for it. In the first months we have sold two horses to America and have met many interesting people and customers via GHC. As the German market is currently very difficult with little prospect of improvement in the near future, we are pleased to have GHC assist us in acquiring international customers and maintaining long-term relationships with them. We are also very impressed with GHC's commitment to present excellent photos and videos of the horses for sale on the internet and to make themselves available for this process. We would very much recommend GHC and are looking forward to continue our positive collaboration. 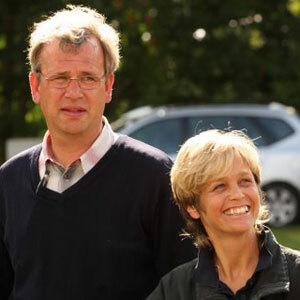 Jens Meyer with his wife Susanne, Hengststation Meyer, Dorum. Our business on its own cannot provide the same marketing service as that provided by German Horse Center (GHC): GHC provides access to a wide range of horses that meet the varied requirements of buyers, and can therefore generate great interest among interested parties in the horses on offer. And the comprehensive customer service results in visits by potential buyers being perfectly planned and executed. For me it is a key point that it is primarily new customers that come to us via GHC. The horse descriptions and videos are realistic, and provide potential customers with a good first impression. Around 60 % – 80 % of the interested parties that come via GHC end up making a purchase from us. We also value the fact that we can retain a direct, trusting relationship with the customers. GHC is a really great marketing platform for us. 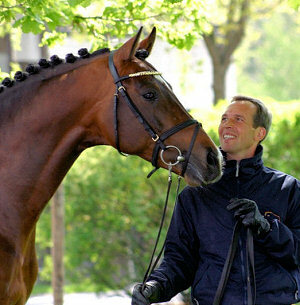 GHC: You have been a German Horse Center (GHC) partner right from the very start. What was is that convinced you to come on board? Julia: It was the friendly and open contact I experienced with GHC and, in particular, the transparent and well thought out business concept. And as a vendor I think it is important that direct customer contact continues after the sale as well. GHC: How has the relationship with GHC developed over time? Julia: The excellent cooperation over the last few years has led to the forming of a very reliable and stable business relationship that is also very positive on a personal level. GHC: GHC is not just a provider of services for the customers, but also for the vendors. What benefits have you experienced? Julia: With GHC we gain better access to international customers, as new markets are covered as a result of GHC’s excellent marketing activities. Furthermore, the entire process is supported by GHC, which lessens our burden in terms of paperwork and logistics considerably. GHC: What experiences have you had with the trainer database? Julia: It has resulted in a number of very satisfactory and successful international training assignments. These have also provided a very good insight into the state of equestrian sport and also the personalities of the hosts in the respective countries (in particular in the Middle East). This allows us to assess the needs of buyers from such countries with much greater certainty. The intensive training associated with bookings here at home also allows pupils to develop rapidly, and it is great as a trainer to see such progress being made in such short periods of time. GHC: Would you recommend GHC to others? Julia: Definitely – I already do in fact!